ONE CABLE. NO COMPROMISES.The Elgato Thunderbolt™ 3 Dock provides outstanding extended versatility, enabling you to unite everything to your computer at once with one cable. For the utmost efficiency, this Multi-Port Dock includes two Thunderbolt™ 3 ports. The built-in DisplayPort allows displays with up to 4K resolution, and you can add a second 4K display connected via USB-C for more productivity. With three additional SuperSpeed USB 3.0 ports, this assures that all of your devices are connected. Experience the full performance of wired network connections with the built-in Gigabit Ethernet port. Appreciate crisp conference calls through the separate microphone input and enjoy the amplified audio output. BUILT-IN DISPLAY PORT The Elgato Thunderbolt™ 3 Dock features a built-in Display Port that can deliver any display up to stunning 4K resolution. Perhaps you want to experience a professional-standard screen to meet your expectations of colour reproduction, or aim to reduce reflections in your office with a non-glare monitor, or unquestionably, you want a stunning display that surpasses all others in size. With this multi-functional dock, you can even simultaneously connect a second 4K display to the USB-C port and enjoy supreme efficiency, without compromise. EFFICIENT MULTI-PORT HUB The Thunderbolt™ 3 Dock is a multi-port hub ready to keep your workspace organised, there is no need to keep re-plugging your peripherals in and out due to your computer’s limitations. Featuring three SuperSpeed USB Ports for a neat desk even when you unplug your notebook. Access the USB port on the front of Elgato Thunderbolt™ 3 Dock, which simply helps you plug in your client's thumb drive without a glitch, without the need to fiddle on the sides of your perfectly situated notebook. VERSATILE CONNECTIVITY Benefit from utilising two Thunderbolt™ 3 ports: one to connect and charge your computer, and one to extend the adaptability of Thunderbolt even further. Connect innovative accessories such as a 5K Thunderbolt™ 3 display, a speedy storage solution, or an adapter for your legacy Thunderbolt 2 devices. With the sheer versatility of USB-C, you can also choose to connect your USB accessories or a further display to the same port – just as you would on your MacBook Pro or Windows laptop, minus the cable untidiness. THUNDERBOLT DOCK UTILITYEnjoy a break from working and avoid the hassle of ejecting your external drives separately. With the free Elgato Thunderbolt Dock Utility, preventing data loss with just one click in your menu bar is easy, disconnect all storage devices at once and instantly see when it's safe to unplug your Thunderbolt™ 3 Dock. 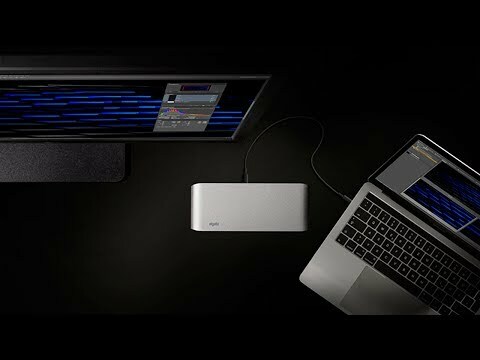 GONE ARE THE DAYS OF RUNNING OUT OF JUICEOffering up to 85 W of power, Elgato Thunderbolt™ 3 Dock charges your MacBook Pro or Windows notebook via the same cable. Your USB devices will also benefit from greater power management: USB-C accessories are always powered with up to 15 W, while the built-in USB 3.0 ports can even charge your iPad, boost your iPhone charge, or power your Apple SuperDrive. No need to think twice if you need to shut down or leave work – as this intelligent hub will charge your devices regardless of whether your computer is off or disconnected. CRYSTAL-CLEAR AUDIO CALLSYour favourite headphones can stay connected with the built-in, amplified stereo audio port featured on the Elgato Thunderbolt™ 3 Dock. An extra, separate audio input port allows you to instantaneously connect a microphone. Experience high-quality crisp conference calls or new assignments that benefits from having your voice heard. 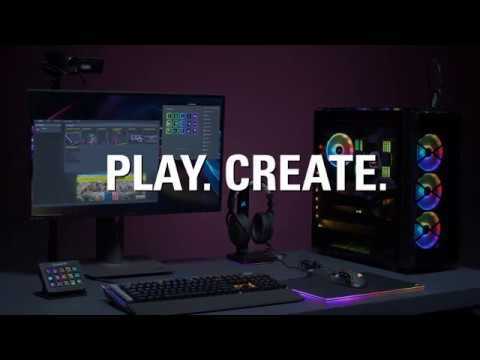 A MORE DEPENDABLE CONNECTIONWired network connections are quicker and more reliable than any Wi-Fi network, and with Elgato Thunderbolt™ 3 Dock, you can tap into the full performance of Gigabit Ethernet. Enjoy rapid connections to your servers, uninterrupted downloads from the internet and dependable file transfers with your co-workers – without an additional adapter dangling clumsily off the side of your notebook.